How're y'all doin'? I'm sure glad you've stopped by! 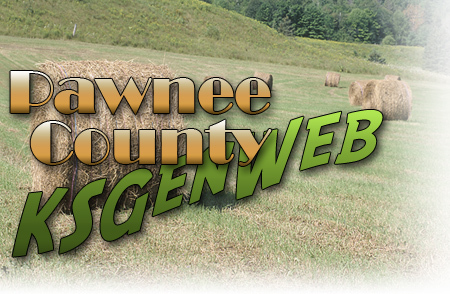 Welcome to the Pawnee County KSGenWeb pages. My name is Kenny Thomas and I'll be your host while you're visiting. Well, If you've visited before you'll notice that I've changed a few thing, adding a few new features to hopefully make it easier and quicker to search through these pages. I've added a new Drop Down Menu, at the bottom of each page is links to also make things easier for you! As always, make yourselves at home, browse around, see if there is anything that may help you in your search for your Pawnee County ancestors. I would also like to ask of you, if you have anything that pertains to Pawnee County, (i.e., census records, tombstone transcriptions, cemetery records, marriage records, obituaries, etc) that may be of assistance to others. Do you have books or other reference materiel pertaining to Pawnee County? Would you like to be a Lookup Volunteer? Please give me a holler, I'll be more than happy to help you in anyway that I can! Enjoy your visit! If you have any comments or suggestions, please let me know! Are you new to genealogical research? If you are just starting out in search of your ancestors, I've provided some links below that may help you. Your local library will also have helpful books to guide you through the many avenues of your search. You may also want to visit your nearest genealogy library, and/or a nearby Family History Center. Kansas Vital Records - How and where to obtain Kansas birth, death, marriage and divorce records. A new twist on the way you can send your surnames and Queries to be posted! Come On, Give it a spin! Do you want to belong to a discussion list that is exclusively for Kansas genealogical researchers? The KS-KIN-L list is a great place for everyone that has genealogical interests in Kansas. To subscribe, send a message to listproc@raven.cc.ukans.edu, and in the Body of the message type the following command: SUBSCRIBE KS-KIN-L Firstname Lastname (Please note, that you need to replace Firstname and Lastname with your own first name and last name.) You must include your name when subscribing. No other information should be typed before or after the command. Ensure that you leave off any auto-signature line(s) that you may have, and to make sure to leave the subject line blank. If you would like to host one of the "orphan" counties for The KSGenWeb Project, contact Debbie Wafford, the Kansas 'Orphan' County Coordinator. Information about the responsibilities of a county host can be found by clicking here. Page Design, HTML Coding and Layout - Copyright�1998-2009 by Kenneth Thomas, All Rights Reserved. Graphic Designs Copyright�1998-2009 by Kenneth Thomas, All Rights Reserved. The KSGenWeb Project logo Copyright�1996-2009 by Tom & Carolyn Ward, All Rights Reserved.